Meet Phil Snyder: new father, nursing assistant at a cutting-edge biotech facility on Staten Island, and all-around decent guy. Trouble is, his life is falling apart. His wife has betrayed him, his job involves experimental surgeries with strange side effects, and his father is hiding early-onset dementia. Phil also has a special talent he doesn't want to publicize?he's a mind reader and moonlights as Brainstorm, a costumed superhero. But when Phil wakes up from a blackout drunk and is confronted with photos that seem to show him assaulting an unknown woman, even superpowers won't help him. Try as he might, Phil can't remember that night, and so, haunted by the need to know, he mind-reads his way through the lab techs at work, adoring fans at Toy Polloi, and anyone else who gets in his way, in an attempt to determine whether he's capable of such violence. 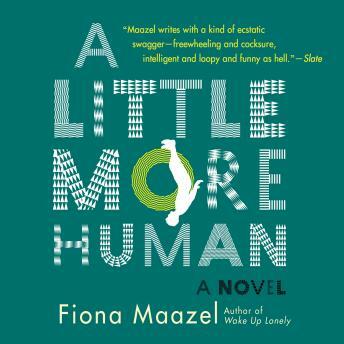 A Little More Human, rife with layers of paranoia and conspiracy, questions how well we really know ourselves, showcasing Fiona Maazel at her tragicomic, freewheeling best.